I used the Majestix branch to create the tree and the nest and one of the little stamps for leaves. The bird is SU Young Vermillion. A good choice of word for the letter - great page. It will be interesting to see what the challenge will be next year. I promise not to mention how many sleeps until the big day again!!! 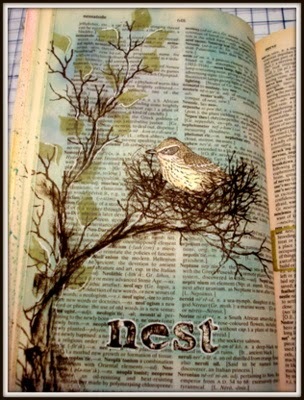 Fantastic page Val... Ilove the tree and the nest and the bird all of it! You've done so well managing to stay the course.. congratulations! Great birdie in his nest and such great subtle colouring! wow, val... this page is absolutely stunning!! just love seeing your alpha pages! 4 more letters to go... I love your nest, it's stunning. This is beautiful - so delicate! Fabulous page. 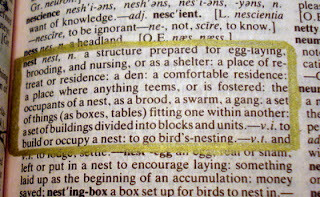 the bird looks so comfortable in the nest. A beautiful subtle page which captures 'nest' so perfectly. Beautiful drawing and gorgeous page! 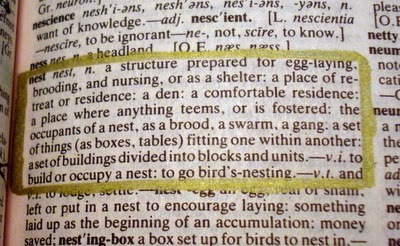 I nearly did nest but mine wouldn't have been anything like as beautiful as yours! Great alteration, Val! Bird and nest are pretty! Great page Val.......isn't that bird gorgeous and looks very happy in it's nest. Sounds like something exciting coming next year in place of the alpha challenge. A certain person's parcel arrived safely. Hope the bathroom's finished now? Oh my this is sooo pretty I love how you did this that bird is so gorgeous in its little nest. Fabulous page, love the nesting bird. How lovely, Valerie! I love how you did your images and the transparency is awesome too!